UK - £1.50 2nd class or £2.50 Signed For. I apologise in advance if this happens to you. It is not done intentionally but it is my fault and I am of course responsible. DIAMANTES WITH MAIN SAPPHIRE COLOURED OVAL PENDANT STONE WITH DIAMANTES SET AROUND IT. In lovely condition. Boxes are for display purposes only and are not included in the sale. A pretty silver tone white crystal cross in good used condition. A VERY ENCHANTING COLLECTABLE BROOCH / PIN. BY KIRKS FOLLY & IS CLEARLY SIGNED TO THE BACK "KIRKS FOLLY". LOVELY TO ADD TO ANY COLLECTION OF JEWELLERY & TO WEAR. 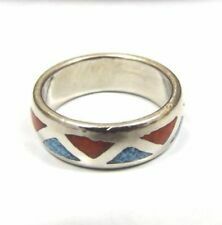 New listingJOB LOT OF VINTAGE & COSTUME JEWELLERY ITEMS, SOME SCRAP. It is set with two bright amber coloured glass stones. Box not included this is a photographic prop. These would make a brilliant gift. 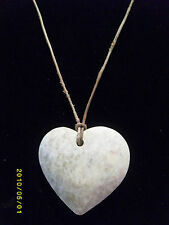 15" long - the largest stone is approx. SO VERY EXQUISITE IN DETAIL.BRIGHT & COLOURFUL MILLEFIORI ALL SET INTO THE LOVELY CURVED & STUDDED PANELS. STILL BEAUTIFUL & BRIGHT. It has beautiful flashes of colour which makes every stone unique. This gorgeous piece of art glass was made in the Czech Republic. It is stamped on the finding Czechoslovakia which is just visible through a loupe. Double row of clear, sparkling glass stones that it is difficult to capture in the pics. This fabulous ruby red glass cabochon was made by Swarovski in the 1970s in Austria. A Charming Brooch. Locket style pendant set with pale lilac glass stones that are sparkly and catch the light. Nice colour for Spring. It has a cream celluloid type base and is fully embellished with alternating clear and pinky-red-gold Aurora Borealis Glass diamanté stones, all present, none missing. This is a gorgeous bangle bracelet believed to date to C1930’s-1950’s. 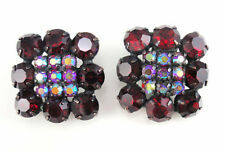 VERY ATTRACTIVE LOOKING BROOCH SET WITH AB RHINESTONE WHICH ATE MULTI COLOURED AND CLAW SET. THIS IS A STUNNING BROOCH AND THE PICTURES DO NOT CAPTURE THE BEAUTY OF THE COLOURS. THERE ARE NO STONES MISSING. Faceted glass oval beads graduate from 24 mm to 10 mm in length. Interspaced with small yellow faceted glass beads. It fastens with a screw barrel clasp. Hand strung onto 14ct Rolled Gold Headpins, Round Spacers, Jumprings & Earhooks (Hallmarked). I am an East Yorkshire Jewellery & Watercolour Teacher and have over twenty years experience. '14ct Rolled Gold '. These would make a brilliant gift. See photos. VINTAGE SIGNED ST JUSTIN PEWTER CELTIC BROOCH. Dispatched with Royal Mail 1st Class. Faux duette style. 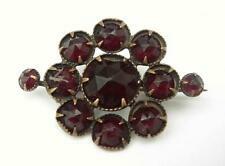 stunning art deco diamante brooch. if we are short of volunteers it may take a little longer. very good condition. There's nothing like a piece of costume jewellery to jazz up an outfit and when that jewellery is a vintage piece it adds an extra hint of glamour to any ensemble. Whatever your individual style there are plenty of unique vintage costume jewellery pieces available, from delicate necklaces to statement rings. If you're looking for a piece of vintage costume jewellery to brighten up an everyday outfit there a few pieces you might like to consider. A vintage brooch is a great way to add a little sparkle to your outerwear without the worry that it will be overpowering and take attention away from you or the rest of your outfit. For something that's work-appropriate a pair of vintage stud earrings are a great way to add a touch of old-school glamour without going over the top. There are earrings with a variety of different precious stones, so whether you're looking for your birth stone or something that simply looks great then you'll be sure to find it. If you're dressing up for an occasion or heading out on the town then a bold piece of vintage costume jewellery will get you noticed for all the right reasons. A brightly coloured pendant necklace would go well over a fitted black dress and create a look that's unique. For a formal occasion, you can't go wrong with pearls. Giving a hint of glamour that's refined and sophisticated a pearl necklace, bracelet or earrings are timeless and will look just as good for many years to come. If you're a vintage connoisseur and you're interested in a specific period then you'll be sure to find something to suit you. 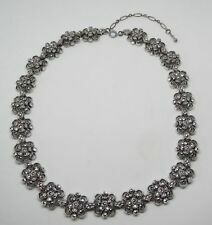 With vintage costume jewellery pieces from the 1930s, 40s, right up to the 80s there's plenty of choice. You can even find pieces dating as far back the 1830s, ideal if you're looking for something with the potential to be a collector's item.